In case you are trying to figure out exactly from where in the watercolor the much smaller banner image is taken, maybe this explanation will help. If you could take the banner that is above and rotate it 180 degrees, it would be right-side-up. It could then overlay part of the lower left hollyhock bloom in the actual painting. Before I had this original framed. I took two frame moulding samples to Mother’s nursing home room. (This would have been within the year before she passed away.) I explained to her that I wanted her to select the moulding sample that she liked best, which she did. After the framing was complete, but before Bill and I hung this watercolor in our home, I once again took Hollyhocks to Mother (still in the nursing home) so she could bask in her painting’s beauty. To view images and size/cost information regarding currently available prints of Mother’s watercolors, click on the “View and Order Prints” link on this blog’s home page. 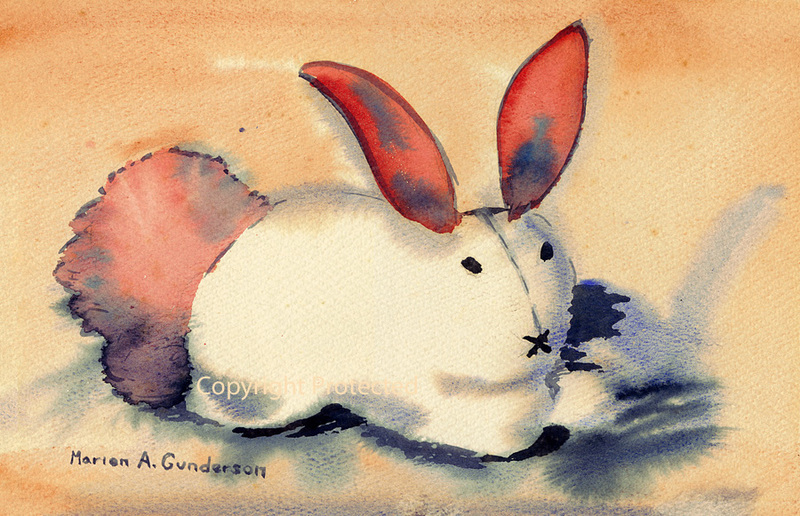 With Easter just around the corner, at present the Bunny prints are in the highest demand. In the actual Bunny prints, the tail and ears look more pink-than-orange than they do on my computer monitor. 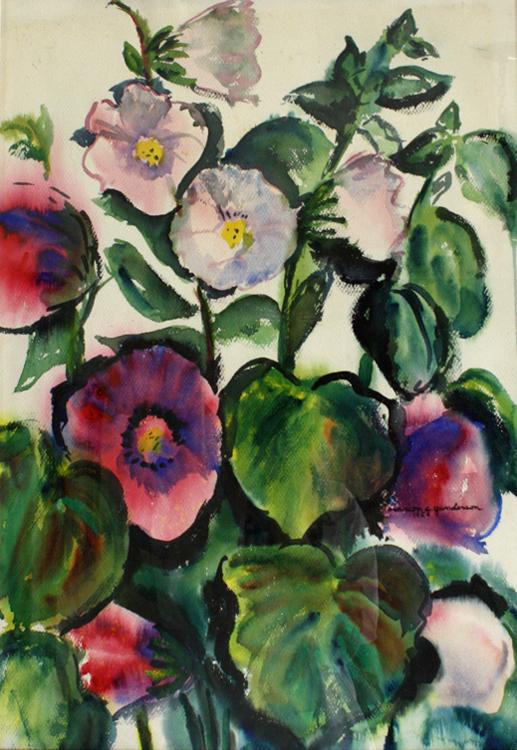 Prints have not yet been made of the Hollyhocks painting. However, if you have an interest in having a print of this watercolor, please contact me at mariongundersonart@gmail.com. *More information about Cathrine Barr and the Barr Art Association is in this post. Within the next year, I hope to have additional information to add about Cathrine and/or the association. This entry was posted on March 14, 2010 at 5:04 pm and is filed under Hollyhocks, Marion Gunderson, Watercolor image. You can follow any responses to this entry through the RSS 2.0 feed. You can skip to the end and leave a response. Pinging is currently not allowed. So very beautiful! Vibrant and delicate all in one. And what priceless times you had with Mother regarding her creation. It must have meant so much to not only you, but also to her. Thank you, Louise, for *your* creation–for those very intentional gifts to her at such an important time. One of the reasons I love you so! I noticed the banner yesterday or early this morning. That was before you wrote about it. I noticed it was different and I liked the colors. What fun for you to select that small palette for the border! Peggy and Clara: What fun to have you both like the comment, including about the colors. Peggy: Actually, the moulding that Mother picked was Bill’s (and the framer’s son’s) second choice. I was on the fence and was so pleased that Mother entered into the selection. I noticed the banner before going further to read any articles – and thought it looked like it was a close up of some portion of a watercolor – and probably one of Mother’s. Then I was so happy to see the photo of the hollyhocks – so beautiful.